Holidays and vacations are meant for relaxation. For some, that means a tent and wilderness solitude. For others, that means pampering. Fortunately for both kinds of people, Banff, Canada and Banff National Park offer options for both kinds of people. If relaxing in soothing, hot, all-natural spring water is an integral part of your trip, then the Banff Upper Hot Springs is for you. While the Hot Springs are operated by Parks Canada, they are anything but rustic. Featuring an historic spa and bath house fed by natural hot springs, the Banff Upper Hot Springs offer all the luxury and amenities of a modern spa, including therapeutic massage. And seeing as they are just few kilometers from the town of Banff, they are set against a backdrop of spectacular Canadian Rockies alpine scenery. You can relax in the comfort of soothing hot water – while letting your eyes rest on majestic, snow-covered peaks and wooded valleys — where travelers have come for more than a century to enjoy the 1930s-era bathhouse and the outdoor, spring-fed hot pool. The hot springs are family friendly if you’re looking for this to do with the kids. It features a children’s wading area and spacious changing rooms with heated floors that include dedicated family changing rooms, so parents can stay with and assist their children. The Banff Upper Hot Springs also have a day spa that offers a variety massage therapies, steam room, aromatherapy, and wellness treatments. The Hot Springs are open year around with extended hours during peak seasons. For more information contact the Banff Upper Hot Springs Pool directly at 403-762-1515 or call our North American toll free Pool Information Line at 1-800-767-1611. So you came to Banff and the weather turned bad. Not to worry, there is plenty to do indoors when the heavens open up and the mountain peaks are covered in mist. Be sure to visit the Cave and Basin National Historic Site, which provides a history of Banff National Park’s creation. Then there is the Banff Park Museum itself: an old-fashioned wildlife display where you are guaranteed to see some critters. No Banff museum tour would be complete without stopping at The Whyte Museum, which holds the world’s largest collection of Canadian Rockies art and literature. Visitors wanting to learn more about the original inhabitants of the area should visit the Buffalo Nations Museum. 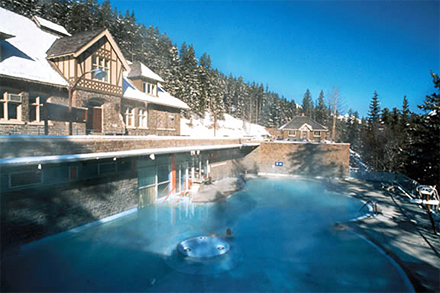 To book admission ahead of your visit to the Banff Upper Hot Springs, contact Banff Travel. Click here for more information on Banff activities, boutique hotels, resorts and other accommodations. Raft The Kicking Horse River!